Bert Ogden Auto Group president Robert Vackar speaks at a press conference Friday morning at the BMW dealership in McAllen. Vackar — seen with his wife, Janet Vackar, Bert Ogden staff and McAllen Mayor Jim Darling — addressed attendees following an announcement that the U.S. Air Force Honor Guard will serve as the "lead step-off" of the upcoming McAllen Holiday Parade. McALLEN — The U.S. Air Force Honor Guard has been announced as the lead step-off of the upcoming McAllen Holiday Parade. The announcement was made at a news conference Friday morning at the Bert Ogden BMW dealership in McAllen. According to city leaders, the honor guard will “set the tone” of the fifth annual parade, which is slated for 6 p.m. Saturday, Dec. 1, kicking off what’s traditionally become a colorful procession of floats, balloons and marching bands. 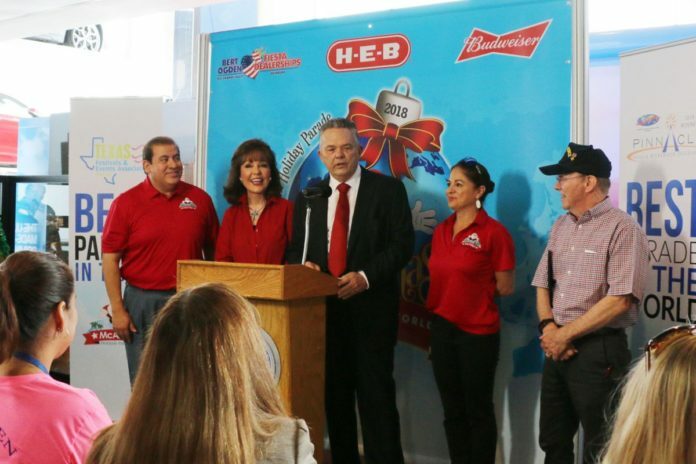 Presented by H-E-B, this year’s parade theme is “Christmas Around the World” and “will be powered by 12,000 horsepower by Bert Ogden and Fiesta Dealerships of the Rio Grande Valley,” according to a McAllen news release. The parade uses 15 miles of rope light generating nearly 2 million lumens, as well as 44,500 cubic feet of helium to keep the balloons afloat, the release further read. The parade will start from McAllen Veterans Memorial Stadium at 2001 N. Bicentennial Boulevard and make its way down the 1.5 mile parade route on Bicentennial toward U.S. Business 83.